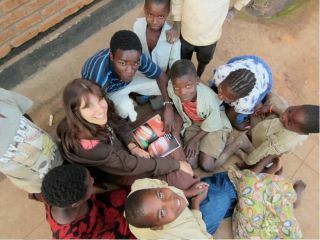 UC Riverside’s Gabriela Canalizo is seen here teaching astronomy to Malawian children. The beauty of space and the thrill of science have helped an American astronomer connect with children in Malawi, despite language and cultural barriers. University of California, Riverside astronomer Gabriela Canalizo has spent seven consecutive summers teaching astronomy to kids ages five to 20 in an orphanage in the southeast African country. She brings a telescope and astronomy books, and she shows scientific videos of star clusters and galaxy collisions to the 220 children at Malawi's Passion Center for Children. Canalizo hopes her visits encourage the children to stay in school, and to get excited about science. "None of the orphanage's children and staff members had seen a telescope before I took one there," Canalizo said in a statement. "Still, they had excellent and imaginative questions. For example, when I explained that stars eventually die, one child asked if the stars die because of disease. Some wanted to know how big the largest star is and how the moon got its craters. From the donated books, they have gotten to learn about Pluto and the other planets." Canalizo has traveled with larger groups of volunteers from around the United States led by Pastor Eric Sythoff of the Crest Community Church in Riverside. Her first visit was in 2006. Since then, the scientist has grown familiar with Malawi. She has learned some of the local language Chichewa, which is spoken in the region around the orphanage, and become accustomed to teaching in classrooms without desks and other basic school supplies. "In the United States, we are much privileged in comparison, and are given much," Canalizo said. "The trips to Malawi are an opportunity to share a little of our wealth of knowledge, our many and abundant resources. I thoroughly enjoy working with the Malawian children. It's fascinating to see how eager they are to learn, to see how, with increasing knowledge, they have started to think about careers. Already, four of the children I have worked with are in Malawian colleges now." Malawi is home to about 16.3 million people. Roughly 11 percent of adults there have AIDS or HIV, which was the cause of 51,000 deaths in 2009, leading to a high population of orphans. Canalizo said she formed many close relationships with the children at the Passion Center. "They'll cry, 'Gaby! Gaby!' when they see me arriving at the orphanage," she said. "And every once in a while, some will call me 'Mom.'"